This is an award-winning, high school level, creation-based marine biology course. The two book set includes a student text and a test and solutions manual. In this lab credit, self-directed course, the student will learn about the physical, chemical, and geographical features of the world's oceans as well as the organisms which live there. Ocean ecosystems are covered, and over thirty labs help students to understand the concepts presented. A workbook for students interested in exploring a career. Helps are included to identify areas of interest, locate businesses, how to write a student resume and cover letter, and how to translate intern hours into credit hours. Worksheets help students document skills learned and activities completed as well as weekly prompts to research and write about their field of interest, including required education or certifications. 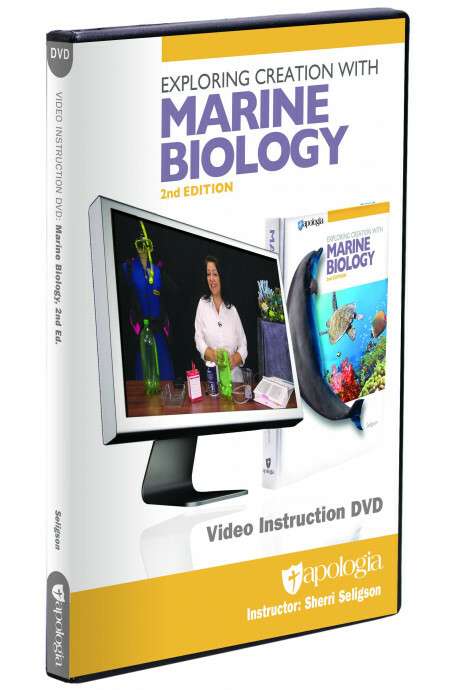 Enhance your student's education with this outstanding instructional .mp4 DVD featuring Apologia author and marine biologist Sherri Seligson. On-location footage takes your student all over the United States and to exotic locales such as the Caribbean and Iceland. Featuring more than twenty hours of instruction, this four-disc DVD also contains animations, Power Point lectures, and video presentations of every experiment from the textbook. Give your student a deeper, clearer understanding of human anatomy and physiology that goes beyond textbook illustrations. Featuring more than twenty hours of instruction, this four-disc DVD also contains animations, Power Point lectures, and video presentations of every experiment from the textbook.